Looking back, July 4, 1863, marked several major turning points in American Civil War history. Vicksburg, Mississippi – the last Confederate stronghold along the Mississippi River – surrendered to Union General Ulysses S. Grant. At Gettysburg, Pennsylvania, the three-day battle had ended and both armies watched each other, tended the wounded, buried the dead, and, when darkness fell, the Confederate army began its retreat back to Virginia. It took time for news of these historic happenings to reach the Confederate capital in Richmond, Virginia. Rumors filtered to the city, but it would be hours later before the news of the defeats was publicly known. In the weeks leading up to July, Union prisoners held in Richmond’s Libby Prison had been working on a scheme. The men had started collecting scraps of red, white, and blue fabrics. While some stood guard or distracted the prison overseers, others pieced and sewed an American flag. 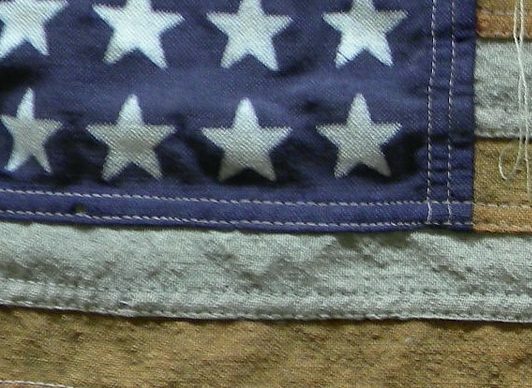 By July 4, 1863, the Stars and Stripes crafted in prison was ready to be unfurled. Unfortunately, the Rebel guards weren’t impressed. They burst in to find the Union flag on full display and ran back to tell the prison commander. The Union men continued the ceremonies until orders arrived from Confederate Captain Turner to pull down the “hateful rag. When the patriots refused to hear the orders, an angry guard shouldered his way through the dense crowd and pulled down the flag. 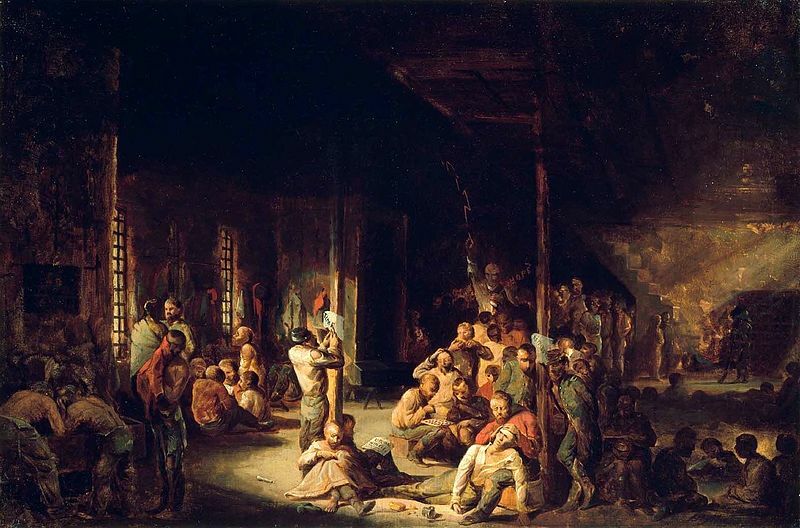 The prisoners waited and disobeyed orders to return to their quarters, staying for the rest of the pro-Union speeches. With more disobedient but quiet prisoners than guards, the Rebels decided to not break up the ceremonies and Union sentiment echoed in the heart of Richmond on that fateful Independence Day. The City of Richmond had several prisons during the Civil War – all of them usually overcrowded (see next section). 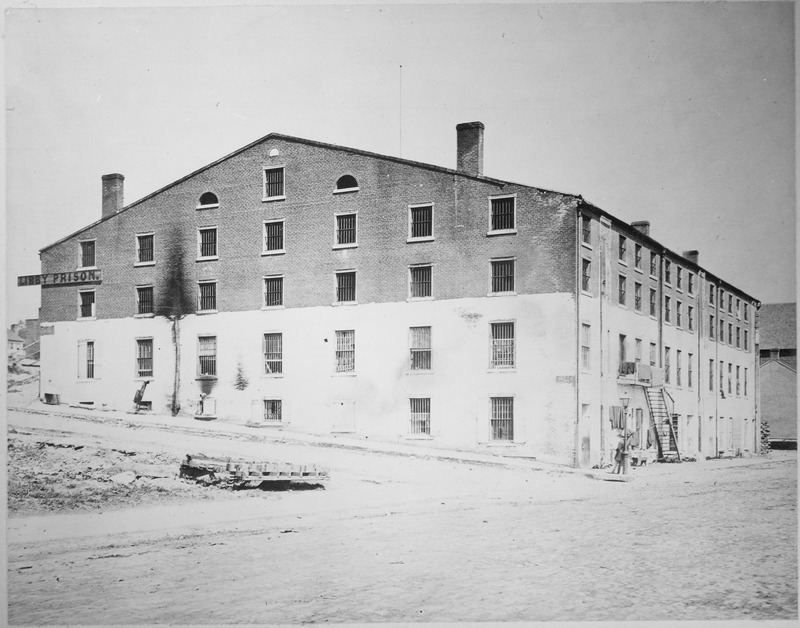 However, Libby Prison gained one of the most infamous reputations. Since it was the site of the patriotic celebration, we’ll focus on a facts related to this facility. In 1861, the Confederate military took over this three story, brick building originally used as a tobacco warehouse and converted it into a prison. By 1862, Libby Prison was used to confine Union officers. The prison was severely overcrowded with 300-500 officers per room by 1863. Food shortages throughout the city limited the prisoners’ rations to frightfully small portions. Sanitation was also a problem in the prison, and disease killed many men. Mortality rate was high, and in post-war writings Libby Prison was often ranked second only to Andersonville in lists of the worst Confederate prisons. Prison fights broken out, but eventually the officers developed “clubs” and even a newspaper to bring order and “civilization” to their life in captivity. Through this type of inter-prison organization the Union flag and patriotic celebration were devised and carried out. Early in the Civil War – just after Richmond became the Confederate capital and while everyone still thought the war would be short – Southern authorities decided that all prisoners captured by the Confederacy would be sent to Richmond for imprisonment or exchange. It might have worked if the conflict had ended quickly, but as the war dragged on and more and more prisoners arrived, it caused series issues for the city. Overcrowding. Lack of supplies. Manpower needed to guard the prisoners. Disease. Strain on the city resources. Just to name a few problems. When the exchange system broke down, conditions worsened. Richmond struggled to find new locations to house prisoners. Several warehouses were used and eventually Belle Island was opened – literally a prison on an island in the James River. Later, other prisons opened in the South – like the infamous stockade at Andersonville, Georgia – but all prisoners were still routed through Richmond and then to other destinations, creating logistical and transportation challenges. Richmond had real trouble with its invented prison system. A variety of causes made this city’s prisons nightmare locations for captive Union soldiers and officers. Still, in these awful conditions, Union-loving patriots pieced together an American flag and celebrated freedom. On July 4, 1863, while other parts of the city anxiously waited for news from the battlegrounds and siege lines and some showed open disdain for the flag, Union officers gathered and in the heart of the Confederate capital – though hidden by brick walls – they unfurled the flag that would one day fly over the city again when the nation was united. My husband and I chose to get married on July 4th for all kinds of reasons, and it was one of the grandest celebrations ever. We had a brass band, flags, and even a flyover of WWII-era planes. It made us both proud of the historical work we do–long may America endure! I remember that! Happy anniversary a few weeks earlier!